Ever since the Apple iPhone 5 was announced, the A6 chipset which powers it has been something of a riddle. With Apple mentioning nothing on the exact specifications, we had to wait another week to find the core count and architecture, as well as the RAM amount and GPU model. Now however, we got to learn the rest of the A6 secrets, thanks to a detailed review of its performance, courtesy of Anandtech. The suspicion that Apple went for a custom CPU architecture was confirmed and we learned that its maximum clock speed is 1.2GHz. The rest of the A6 specs highlights include 1GB of RAM and a PowerVR SGX 543MP3 three-core GPU. More importantly, however, we found out how those perform in real life and how the iPhone 5 compares to the other iOS products and the Android top dogs. 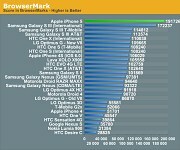 The guys from Anandtech went for the browser tests first, and saw the Apple iPhone 5 to have a huge advantage over its competitors. 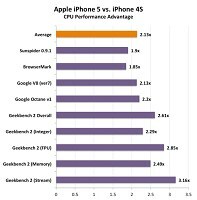 The A6 chipset helped the new iOS flagship make easy work of the competition at the BrowserMark, SunSpider and even Google’s own V8 tests. Whether or not the iPhone 5 is the ultimate browsing device greatly depends on your screen size, resolution and browser preferences, but it’s sure shaping to be the fastest one around. 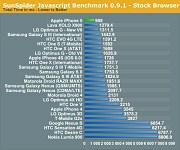 The GPU benchmarks came next and the Apple iPhone 5 was able to pass the test with flying colors, too. Despite being a core short of the A5X GPU inside the new iPad, the A6 PowerVR SGX 543MP3 came very close to it in terms of raw performance. And since the iPhone 5 has far lower resolution than the third-generation iPad, it should offer even higher framerates on those games. The beastly graphics chip swept away current Android top dogs, and only came slightly short of the Adreno 320 inside the LG Optimus G. Once again, though, the lower resolution helped the iPhone 5 get better real-life framerates. 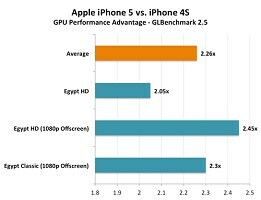 Finally, we got a couple of charts, comparing the iPhone 5 performance to that of the iPhone 4S. It turns out that the A6 easily delivers on the 2x performance increase promise. An interesting detail came up during that review. Apparently the iPhone 5 is able to improve its performance by a further 10% when not connected to a carrier’s network. It’s yet unclear why the difference is so dramatic, but the reviewer promises to look into it and report back if he finds anything. For even more tests follow the source link. Even samsung quad can't match iphone dual core, whats the point with quad.